For other uses, see Bundaberg (disambiguation). The name was coined by surveyor John Charlton Thompson and his assistant Alfred Dale Edwards. Bunda is derived from the name one of the kinship groups of the local Taribelang people, to which was added the Saxon suffix berg, meaning "town". Colloquially the city is known as "Bundy". Bourbong Street is the main street of the city and there is some controversy in regards to its spelling and meaning; Bourbong was alternatively spelled Bourbon or Boorbong, which was a local Aboriginal title given to a large waterhole in the area. The main street was historically also gazetted in the Bundaberg Mail as "Bourbon" street, but by 1941 there is no reference to "Bourbon" street. Robert Strathdee's farming selection in the vicinity of the watering holes was recorded on early survey maps as 'Boorbung'. A pioneer pastoralist of the region, Nicholas Tooth, wrote that "Bourbong" was derived from the local Aboriginal phrase "bier rabong", meaning "plenty dead". Tooth, who took up land in the area in the early 1860s, found that Aboriginal people resolutely avoided the "bier rabong" vicinity. He later found the skeletal remains there of around twenty Aboriginal people who were apparently massacred in a raid by the Native Police. The local Aboriginal group is the Taribelang people of the Gureng nation. They are the original inhabitants of the region which stretches from the Burrum River in the south to the Burnett River in the north. The four kinship groups of the Taribelang people were called Banjurr, Barrang, Bunda and Turroine. The first non-indigenous man to visit the area was James Davis in the 1830s. He was an escaped convict from the Moreton Bay Penal settlement who lived with the Kabi people to the south of the region. He resided mostly around the Mary River and was referred to as Durrumboi. The Burnett River was surveyed by John Charles Burnett, after whom it was named during his exploration mission of the Wide Bay and Burnett regions in 1847. British occupation of the land in the region began in 1848 when pastoral squatters Gregory Blaxland Jnr and William Forster brought in their large herds of livestock to set up a sheep station. Blaxland was a son of the Blue Mountains explorer, Gregory Blaxland, and Forster was later to become a Premier of New South Wales. They selected a very large area of land which encompassed most of the modern day Bundaberg region along the Burnett River. They named this pastoral lease Tirroan. Blaxland and Forster had previously set up sheep stations just south of the Clarence River and had a notable history of frontier conflict with Aboriginals while taking forcible possession of the land. These methods continued at Tirroan resulting in the killing of two of their shepherds in 1849. An armed punitive mission led by Forster and Blaxland followed, causing multiple Aboriginal deaths. Further conflict occurred the following year where Blaxland was clubbed to death. Forster and a number of other squatters conducted another reprisal, resulting in a large massacre of Aboriginals in scrubland toward the coastal part of Tirroan. A couple of years later, Forster sold the property and the name of the pastoral lease changed to Gin Gin. The area was gradually subdivided with the advance of closer settlement beginning in the 1860s. The names of Tirroan and Gin Gin are commemorated in the naming of two towns near Bundaberg which were once part of the massive initial leasehold. Bundaberg itself was founded in 1867 as a British township by timbergetters and farmers John and Gavin Steuart. The settlement of Bundaberg originally began on the northern banks of the Burnett River in 1867 but an official survey was undertaken in 1869 and the town was re-sited onto the higher, southern banks. The first land sale held in Bundaberg occurred on 22 August 1872, although two previous sales of Bundaberg land had taken place in Maryborough. The area developed as an agricultural and port town. Initially a number of the early settlers exploited the timber on their selections but as a result of the incentives of the Sugar and Coffee Regulations 1864, sugar became a major component in Bundaberg's development from the 1870s.The first farmers in the area, including Thomas Watson, arrived soon after. Local resident and District Surveyor John Charlton Thompson was directed by the government to survey and plot an area on the south side of the river. The city was surveyed, laid out, and named Bundaberg in 1870. Timber was the first established industry in Bundaberg. In 1868, Samuel Johnston erected a sawmill in Waterview, on the north bank of the Burnett River (downstream from the Steuart and Watson holdings). Waterview sawmill supplied Rockhampton as well as local needs. It became prominent enough to prompt the government to extend the railway connecting North Bundaberg with Mount Perry, eastward to the Waterview Mill. Waterview sawmill closed in 1903 after being damaged by flood. Experimental sugar cane cultivation in the district followed, and a successful industry grew. The first sugar mill was opened in 1882. The early sugar industry in Bundaberg was based on Kanakas workers, who were kept in a status close to slavery. The three surveyors named Bundaberg's streets. Thompson was assisted by unregistered surveyor assistants James Ellwood and Alfred Dale Edwards. Edwards preferred using aboriginal names: Kolan, Woongarra, Barolin, Bingera, Kalkie, Woondooma, Moolboolooman, and for streets Tantitha, Bourbong, etc. With the passage of the Local Authorities Act 1902, Barolin Division became the Shire of Barolin and the Borough of Bundaberg became the Town of Bundaberg on 31 March 1903. On 22 November 1913, Bundaberg was proclaimed a City. The 1911 Queensland sugar strike occurred after the phasing out of South Sea Islander labour in 1904, with workers claiming that many plantation owners had substituted black indentured labourers (sometimes referred to as slaves) with white ones. Workers sought better accommodation, wages and conditions, including an eight-hour day and a minimum weekly wage of 30 shillings, including food. The mobilisation of unionists from Bundaberg to Mossman was a major achievement, with the 1911 strike lasting over seven weeks in Bundaberg where the town's economy was largely based on the sugar industry. The end result of the strike was a Commonwealth Royal Commission into the sugar industry in 1911–12, which had been initially requested by Harry Hall, a Bundaberg AWA organiser in 1908 with a petition signed by 1500 Bundaberg sugar workers. The Royal Commission, with ALF Secretary Albert Hinchcliffe as secretary, concluded the AWA demands had been justified. The union victory was a watershed in organised labour in Queensland and Australia. In 1912 Bundaberg pioneering aviator Bert Hinkler built and successfully flew his own glider on Mon Repos beach. He also completed a noteworthy non-stop flight from London to Turin in 1920. The following year in 1921 Hinkler flew from Sydney to Bundaberg, non-stop, in a record breaking flight of 8 and a half hours, in the process beating a telegram he had sent to his mother, to warn her of his arrival. The Bundaberg War Memorial commemorating those who died in the Anglo-Boer War and World War I was unveiled by Major-General Charles Brand on 30 July 1921. The Bundaberg digger was imported from Italy and is constructed of Italian marble. The completed memorial, at a cost of £1,650, was the third most costly to be erected in Queensland. It is a major regional memorial and one of the two most intact digger memorials that remain in their original settings of intersections. In the 1960s the township was completely flooded by the Burnett river. In 1967 Bundaberg celebrated its centenerary by producing a coin and opening The Bundaberg and District Historical Museum in the Bundaberg Botanical Gardens in Bundaberg North. In December 2010, Bundaberg suffered its worst floods in 60 years, when floodwaters from the Burnett River inundated hundreds of homes. Two years later, in January 2013, Bundaberg experienced its worst flooding in recorded history as a result of Cyclone Oswald. Floodwaters from the Burnett River peaked at 9.53 meters. Over 4000 properties and 600 businesses had been affected by floodwaters, which moved in excess of 70 km/h. Two defence force Blackhawk helicopters were brought in from Townsville as part of the evacuation operation, which ultimately used an additional 14 aircraft. Cnr Woongarra and Maryborough streets, Bundaberg Central: Christ Church, Bundaberg The church sits adjacent to Buss Park which contains a memorial to Bert Hinkler. In the 2016 Census, there were 69,061 people in Bundaberg (Significant Urban Area). 81.2% of people were born in Australia. The next most common countries of birth were England 3.2%, New Zealand 1.8%, Philippines 0.7%, South Africa 0.5% and Scotland 0.4%. 88.9% of people spoke only English at home. Other languages spoken at home included Mandarin 0.5%, Italian 0.4%, German 0.3%, Afrikaans 0.2% and Tagalog 0.2%. The most common responses for religion were No Religion 26.3%, Catholic 18.7% and Anglican 18.6%. 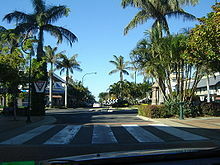 Bundaberg has a humid subtropical climate (Cfa) with wet hot summers and mild winters. The climate is the most equable of any Australian town or city and ranked 5th on a worldwide comparison. The mean daily maximum temperature is highest in January at 30.3 °C (86.5 °F) Celsius, and the mean daily minimum is lowest in July at 9.9 °C (49.8 °F). The coldest temperature recorded in Bundaberg is −0.7 °C (30.7 °F) degrees Celsius, and some inland areas of Bundaberg sometimes experience frosts. The mean annual rainfall is 1,142.6 mm (44.98 in). Looking down Bourbong Street, Bundaberg town centre. Bundaberg town centre with Bundaberg General Post Office to the right. 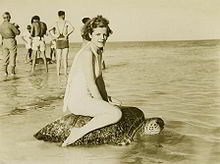 Young woman riding on the back of a turtle at Mon Repos Beach, near Bundaberg, ca. 1930. Subtropical Bundaberg is dependent to a large extent on the local sugar industry. Extensive sugar cane fields have been developed throughout the district. Value-adding operations, such as the milling and refinement of sugar, and its packaging and distribution, are located around the city. A local factory that manufactured sugar-cane harvesters was closed down after it was taken over by the US multinational corporation Case New Holland. Most of the raw sugar is exported. A bulk terminal for the export of sugar is located on the Burnett River east of Bundaberg. Another of the city's exports is Bundaberg Rum, made from the sugar cane by-product molasses. Bundaberg is also home to beverage producer Bundaberg Brewed Drinks and Craft Brewery Bargara Brewing Company. Commercial fruit and vegetable production is also significant: avocado, banana, bean, button squash, capsicum, chilli, citrus, cucumber, custard apple, egg fruit, honeydew melon, lychee, mango, passionfruit, potato, pumpkin, rockmelon, snow peas, stone fruit, sweet corn, sweet potato, tomato, watermelon, zucchini. Macadamia nuts are also grown. Because of its high rate of unemployment, Bundaberg has been referred to as the "dole capital of Australia". Tourism is an important industry in Queensland, and Bundaberg is known as the 'Southern Gateway to the Great Barrier Reef'. The city lies near the southern end of the reef in proximity to Lady Elliot and Lady Musgrave Islands. The nearby town of Bargara is an increasingly popular holiday and retirement destination. Nearby beaches are popular with both locals and tourists. Moore Park Beach, to the city's north, has 20 kilometres (12 mi) of golden sandy beach. Beaches on the southern side of the Burnett River are (from north to south) the Oaks Beach, Mon Repos, Nielsen Park, Bargara Beach, Kellys Beach, Innes Park and Elliott Heads. Tours of the Bundaberg Rum distillery and attractions at Bundaberg Botanic Gardens, such as the 2 ft narrow gauge Australian Sugar Cane Railway, are also popular with tourists. The Mystery Craters, 35 unexplained water-filled holes in the ground, discovered in 1971 at South Kolan, are also a tourist attraction. Opened in 2002 by the former member for Hinkler Paul Neville, the Tom Quinn Community Centre gardens (a multiple "Bundy in Bloom" winner) is a site to be seen with local flora and fauna, its own cafe, marketplace, chapel, green house, training facilities, woodwork and indigenous nature section. Other local attractions and events include the Whaling Wall, East Bundaberg Water Tower, Baldwin Swamp Environmental Park, Alexandra Park Zoo, Buss Park, Barrell House, Bundy in Bloom, Whale watching, reef tours of Lady Musgrave & Lady Elliiot islands, the Bundaberg Show, Bundaberg & Childers Regional Art Galleries, the Bundaberg Gliding school, Fishing Charters, the Bundaberg International Air Show, and the Woongarra Marine Park. The Bundaberg region contains a variety of museums and art galleries that showcase the region's history and culture. Bundaberg has two cinemas. The Reading Cinemas, on Johanna Boulevarde, west Bundaberg, and the Moncrieff Entertainment Centre (formerly known as the Moncrieff Theatre), located on Bourbong Street, central Bundaberg. The Moncrieff Entertainment Centre also holds live musical and theatrical performances year round. The Bundaberg Regional Art Gallery (BRAG) is a large multi-purpose visual arts facility located in central Bundaberg. The Bundaberg Regional Council operates a public library at 49 Woondooma Street. ABC Local Radio: Wide Bay 855 AM/100.1 FM – due to the terrain of the area, both AM and FM frequencies are used. Sea FM 93.1 (commercial) – part of the Today Network, owned by Southern Cross Media Group . Bundaberg is served by three commercial television stations (Seven Queensland, WIN Television and Nine) and publicly owned services (ABC TV) and (SBS). Local news coverage of Bundaberg and the Wide Bay is provided on all three commercial networks with both Seven Queensland's Seven Local News and WIN Queensland's WIN News half-hour bulletins airing at 6pm each weeknight. Southern Cross Austereo also airs brief local news updates at various intervals throughout the day on Channel 9, presented from studios in Canberra. the 2014 film, Talking Back at Thunder, starring Steven Tandy. Most major Australian sporting codes are played in Bundaberg. Bundaberg has two current clubs playing in the AFL Wide Bay competition. Bundaberg has two professional teams competing in the Australian Basketball Association's Queensland Conference (QBL). They are the Bundaberg Radiology Bulls (men) and Bundaberg Radiology Bears (women) and both feature local players. Bucca Weir, west of Bundaberg, is home to the Queensland State Rowing Championships every year in December. The Bundaberg Rugby Football League is a nine-club competition run under the Queensland Rugby League's Central Division. Bundaberg competes in the Central Division's 47th Battalion Shield and the Bundaberg Grizzlies formerly competed in the Queensland Cup statewide competition. Bundaberg is home to the Bundaberg Spirit soccer club. They participate in the Queensland State League against other teams across Queensland. The Bundaberg & District Tennis Senior Association operates eleven floodlit clay courts in Drinan Park, Bundaberg West at the corner of George & Powers Streets. Competition tennis is played all year round. The Bundaberg & District Junior Tennis Association operates five artificial grass courts, and two granite courts. The Bundaberg branch of the Queensland Country Women's Association meets at the QCWA Hall at 15 Quay Street, Bundaberg Central. The Hinkler branch of the Queensland Country Women's Association meets at the McDonalds Central Bundaberg on the corner of Woongarra & Targo Street, Bundaberg Central. There are many public and private primary schools in Bundaberg. Bundaberg South State School opened on 11 May 1891, with an enrollment of 167 students and under the direction of William Benbow. The school celebrated its 125-year anniversary in 2016. Bundaberg has three public high schools, Bundaberg North State High School which opened on 29 January 1974, Bundaberg State High School which opened on 30 January 1912  (the second-oldest high school in Queensland that is still open) and Kepnock State High School which opened on 28 January 1964. There are also three main private secondary schools: Shalom Catholic College, St Luke's Anglican School, and Bundaberg Christian College. There is a campus of the Wide Bay Institute of Technical and further education on Walker St and a campus of the Central Queensland University, located adjacent to the airport. There is a campus of the Booth College at the Salvation Army's Tom Quinn Community Centre. View of Bundaberg town centre from the Burnett River bridge. Bundaberg Airport has flights to Brisbane and Lady Elliot Island. The city is home to the Jabiru Aircraft Company, which designs and manufactures a range of small civil utility aircraft. Bundaberg's bus operator is Duffy's City Buses. As of 2013, they transport over 1000 passengers in town services, and over 2000 passengers in school services every day. Routes extend to the beach suburbs of Burnett Heads, Bargara, and Innes Park. Stewart & Sons also operates bus services in the area. Bundaberg is serviced by several Queensland Rail passenger trains, including the Tilt Train and is approximately four and a half hours north of Brisbane by rail. The closed North Bundaberg station formerly served the Mount Perry railway line and is now a museum. Bundaberg is situated at the end of the Isis Highway (State Route 3), approximately 50 kilometres (31 mi) east of its junction with the Bruce Highway. Many long-distance bus services also pass through the city. Bundaberg Port is located 20 kilometres (12 mi) northeast of the city, at the mouth of the Burnett River. The port is a destination for ships from Australia and overseas. It is predominantly used for shipping raw sugar and other goods related to that industry such as Bundaberg Rum. Bundaberg is served by three hospitals. One public hospital, Bundaberg Base Hospital on Bourbong St, and two private hospitals, Friendly Society Private Hospital & Mater Hospital. The Friendly Society Hospital has undergone a redevelopment and forms part of the GP Super Clinic Program. Bundaberg is also home to the Royal Flying Doctor Service, who regularly transport patients to Bundaberg from more rural and remote areas, as well as transferring critically ill patients to Brisbane for specialist care. The city council responsible for the Bundaberg Region maintains Sister City arrangements with two cities. Prime Ministers Andrew Fisher and Frank Forde both represented Federal electorates that included Bundaberg, though neither was originally from the area. ^ a b c Australian Bureau of Statistics (27 June 2017). "Bundaberg (Significant Urban Area)". 2016 Census QuickStats. Retrieved 23 September 2018. ^ "2011 Census Community Profiles: Bundaberg". ABS Census. Australian Bureau of Statistics. Archived from the original on 5 March 2018. Retrieved 15 September 2016. 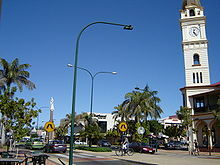 ^ "Bundaberg - city (entry 5190)". Queensland Place Names. Queensland Government. Retrieved 21 June 2017. ^ "EARLY BUNDABERG". The Daily Mail (6679). Queensland, Australia. 23 July 1923. p. 8. Retrieved 9 December 2018 – via National Library of Australia. ^ "Correspondence". Cairns Post. XXIV, (641). Queensland, Australia. 18 January 1910. p. 7. Retrieved 9 December 2018 – via National Library of Australia. ^ "MEETINGS". The Brisbane Courier. LI, (11, 556). Queensland, Australia. 28 January 1895. p. 3. Retrieved 9 December 2018 – via National Library of Australia. ^ "The Derivation of "Bundaberg."". The Queenslander. 7 May 1892. p. 891. Retrieved 23 January 2016 – via National Library of Australia. ^ Petrie, C.C. "Tom Petrie's Reminiscences of Early Queensland". archive.org. Retrieved 16 October 2018. ^ "Christ Church, Bundaberg" (PDF). Bundaberg Regional Council. Archived (PDF) from the original on 22 March 2016. Retrieved 28 May 2015. ^ "CLARENCE RIVER HISTORICAL SOCIETY". Daily Examiner. 28, (8999). New South Wales, Australia. 5 June 1937. p. 8. Retrieved 17 October 2018 – via National Library of Australia. ^ Laurie, Arthur. "Early Gin Gin and the Blaxland Tragedy" (PDF). University of Queensland Library. Retrieved 17 October 2018. ^ "Bundaberg". Archived from the original on 14 May 2016. ^ a b c d e "History of Bundaberg". Bundaberg Regional Council. Archived from the original on 17 February 2011. Retrieved 21 September 2010. ^ "History of Bundaberg". Bundaberg Regional Council. Archived from the original on 15 February 2014. Retrieved 26 December 2013. ^ Kerr, John (1998). "Report on Site Visits" (PDF): 298. Archived from the original (PDF) on 14 February 2014. Retrieved 26 December 2013. ^ a b Hall, James; Dening, Jill (1988). Beautiful Sugar Country. West End, Queensland: Child & Associates Publishing. p. 2. ISBN 0-949267-86-4. ^ Queensland Government Gazette, Vol. CL, 22 November 1913, p.1422. ^ Janette Nolan, Bundaberg, history and people, St Lucia: University of Queensland press, 1978, p. 147. ^ Brisbane Courier, 21 October 1908, p.5; Nolan, p. 146. ^ "Fallon House (entry 602814)". Queensland Heritage Register. Queensland Heritage Council. Retrieved 1 August 2014. ^ Dr K H Kennedy, "The Rise of the Amalgamated Workers Association" in Lectures on North Queensland History, James Cook University, Second Series 1975, pp. 198-199. ^ O'Connor, T. (1996). A Pictorial History Of Queensland. Brisbane: Robert Brown & Associates (Qld) Pty Limited, pp.271-272. ^ "Bundaberg Soldiers' Memorial". The Queensland Times (DAILY ed.). Ipswich, Qld. 1 August 1921. p. 6. Retrieved 6 April 2014 – via National Library of Australia. ^ "Bundaberg War Memorial". Monument Australia. Archived from the original on 7 April 2014. Retrieved 6 April 2014. ^ Calligeros, Marissa and Cameron Atfield (30 December 2010). "Second Queensland town evacuated due to floodwater". The Sydney Morning Herald. Retrieved 30 December 2010. ^ Honor, Dwayne; Regan, Ben. "Bundaberg Floods – The Science Behind the Story" (PDF). Archived (PDF) from the original on 13 June 2017. Retrieved 13 June 2017. ^ "Kalkie State School (entry 600971)". Queensland Heritage Register. Queensland Heritage Council. Retrieved 7 July 2013. ^ "Bourbong Street Weeping Figs (entry 602065)". Queensland Heritage Register. Queensland Heritage Council. Retrieved 7 July 2013. ^ "Bundaberg War Memorial (entry 600364)". Queensland Heritage Register. Queensland Heritage Council. Retrieved 7 July 2013. ^ "Bundaberg War Nurses Memorial and Park (entry 600365)". Queensland Heritage Register. Queensland Heritage Council. Retrieved 7 July 2013. ^ "Kennedy Bridge (entry 600367)". Queensland Heritage Register. Queensland Heritage Council. Retrieved 7 July 2013. ^ "Bundaberg Post Office (Place ID 106125)". Australian Heritage Database. Department of the Environment. Retrieved 30 September 2018. ^ "Bundaberg School of Arts (entry 600362)". Queensland Heritage Register. Queensland Heritage Council. Retrieved 7 July 2013. ^ "Commercial Bank of Sydney (former) (entry 600363)". Queensland Heritage Register. Queensland Heritage Council. Retrieved 7 July 2013. ^ "Bundaberg Central State School (entry 601533)". Queensland Heritage Register. Queensland Heritage Council. Retrieved 16 December 2017. ^ "St John's Lutheran Church, Bundaberg (entry 602815)". Queensland Heritage Register. Queensland Heritage Council. Retrieved 7 July 2013. ^ "South Sea Islander Church and Hall (entry 602052)". Queensland Heritage Register. Queensland Heritage Council. Retrieved 7 July 2013. ^ "Fallon House (entry 602814)". Queensland Heritage Register. Queensland Heritage Council. Retrieved 7 July 2013. ^ "St Andrews Uniting Church (entry 602489)". Queensland Heritage Register. Queensland Heritage Council. Retrieved 7 July 2013. ^ "Bundaberg Police Station Complex (former) (entry 601762)". Queensland Heritage Register. Queensland Heritage Council. Retrieved 7 July 2013. ^ "Burnett Bridge (entry 600368)". Queensland Heritage Register. Queensland Heritage Council. Retrieved 7 July 2013. ^ "Saltwater Creek Railway Bridge (entry 600370)". Queensland Heritage Register. Queensland Heritage Council. Retrieved 7 July 2013. ^ "Sir Anthony's Rest (entry 602053)". Queensland Heritage Register. Queensland Heritage Council. Retrieved 7 July 2013. ^ "East Water Tower (entry 600369)". Queensland Heritage Register. Queensland Heritage Council. Retrieved 7 July 2013. ^ "Fairymead House (entry 601009)". Queensland Heritage Register. Queensland Heritage Council. Retrieved 7 July 2013. ^ "4BU Radio Station (former) (entry 601284)". Queensland Heritage Register. Queensland Heritage Council. Retrieved 7 July 2013. ^ "Christ Church, Bundaberg" (PDF). Local Heritage Register. Bundaberg Regional Council. Archived (PDF) from the original on 20 December 2016. Retrieved 8 December 2016. ^ "Climate statistics for Australian locations". Bureau of Meteorology. Archived from the original on 17 March 2014. Retrieved 1 April 2014. ^ "What's Growing?". Bundaberg Fruit and Vegetable Growers. Archived from the original on 27 December 2013. Retrieved 27 December 2013. ^ "Electra going nuts for macadamias". Bundaberg NewsMail. 28 May 2013. Archived from the original on 27 December 2013. Retrieved 27 December 2013. ^ Allyson Horn (21 September 2017). "Welfare quarantine on the cards for thousands of Queenslanders in Wide Bay region". ABC News. Australian Broadcasting Corporation. Archived from the original on 21 September 2017. Retrieved 21 September 2017. ^ a b c Vanessa Marsh (17 December 2009). "Bundaberg region a tourist haven". NewsMail. APN News & Media. Archived from the original on 2 October 2011. Retrieved 21 September 2010. ^ "Australian Sugar Cane Railway (ASCR), Bundaberg". qldrailheritage.com. Archived from the original on 9 March 2014. ^ "Mystery Craters". Tourism Queensland. Archived from the original on 30 October 2011. Retrieved 21 September 2010. ^ "TQCC » salvos.org.au/bundaberg/". Archived from the original on 4 March 2016. ^ Cook, Penny (2006). Discover Queensland Heritage. Corinda, Queensland: Pictorial Press Australia. p. 29. ISBN 1876561424. ^ "Bundaberg City Galleries, Museums and Collections Attractions – Bundaberg Region QLD". bundabergregion.org. Archived from the original on 29 September 2015. ^ "Tours". www.bundabergrum.com.au. Archived from the original on 21 January 2016. Retrieved 22 January 2016. ^ "Moncrieff Entertainment Centre". Archived from the original on 24 May 2012. Retrieved 25 June 2012. ^ "Bundaberg Regional Art Gallery". Archived from the original on 21 August 2012. Retrieved 25 June 2012. ^ "Bundaberg Library (Public Libraries Connect)". State Library of Queensland. Archived from the original on 13 December 2017. Retrieved 13 December 2017. ^ "NewsMail". Archived from the original on 15 June 2012. Retrieved 25 June 2012. ^ "Guardian". apnarm.com.au. Archived from the original on 9 April 2013. ^ "Bugle Newspaper". TrueLocal.com.au. Archived from the original on 30 March 2013. ^ "Coastline Newspaper Group – Home". coastlinenews.com.au. Archived from the original on 3 May 2013. ^ "Tennis Bundaberg Website" (PHP). Bundaberg & District Tennis Senior Association. 2008. Archived from the original on 31 January 2009. Retrieved 21 December 2008. ^ a b "Branch Locations". Queensland Country Women's Association. Archived from the original on 26 December 2018. Retrieved 26 December 2018. ^ a b c d e "Opening and closing dates of Queensland Schools". Queensland Government. Retrieved 18 April 2019. ^ a b "Bundaberg South State School 1891-2016" (PDF). imags. 2016. Archived (PDF) from the original on 3 February 2018. Retrieved 3 February 2018. ^ "Bundaberg North SHS". Archived from the original on 2 February 2017. Retrieved 30 January 2017. ^ "Bundaberg SHS". Archived from the original on 2 February 2017. Retrieved 30 January 2017. ^ "Kepnock SHS". Archived from the original on 2 February 2017. Retrieved 30 January 2017. ^ "Tom Quinn Community Centre, Bundaberg". Archived from the original on 6 March 2016. ^ "Duffy's City Buses". Duffy's City Buses. Archived from the original on 27 March 2013. Retrieved 20 February 2013. ^ "Stewart and Sons Coaches". stewarts-coaches.com.au. Archived from the original on 22 April 2014. ^ "GP Super Clinics Programme". Archived from the original on 15 July 2017. Retrieved 2 February 2018. ^ bundaberg.qld.gov.au/sistercity Archived 10 November 2014 at the Wayback Machine, Bundaberg Regional Council. Retrieved 4 September 2014. 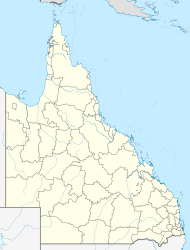 Wikimedia Commons has media related to Bundaberg, Queensland. Wikivoyage has a travel guide for Bundaberg.